The news that Frank de Boer is on the verge of losing his job at Crystal Palace after just four games is a bit surprising. Of course, the Eagles lost all of their first three Premier League games and have yet to score a goal. But the more worrying thing over there is the fact Palace’s performances have not been very convincing. The same De Boer candidly admitted they were “uncomfortable with how we played”. The former Ajax manager was appointed in late June to succeed Sam Allardyce in south London after a long process of selection made by the chairman Steve Parish, under the eye of the club’s American shareholders David Blitzer and Josh Harris. De Boer was finally appointed at Selhurst Park on a three-year contract that promised a long commitment to the Dutchman’s football thinking with the goal to make Crystal Palace an established Premier League team. Instead, the Eagles looked terrible under De Boer and seem poised to struggle with relegation once again. So, after another bad performance against Swansea City on Saturday, multiple reports claim a meeting was scheduled between Parish and the manager to discuss the atrocious start of the new season and the way the Dutchman is approaching Premier League matches. The question is that the 47-year old manager wants to install a Dutch possession-based style of football around a building from a three at the back defence, that is still not assimilated by his players. In fact, De Boer is trying to do it with a roster mainly assembled by former manager Sam Allardyce and his predecessors. Ian Holloway, Tony Pulis, Neil Warnock, Alan Pardew, and Allardyce are all well know supporter of a more direct approach. Andros Townsend was on the same page: “We are not struggling with the new formation and system, because we used it in pre-season and did well.” he said. Right now, we will take a look at the latest Palace game in the way to better scrutinize the dynamic of De Boer’s play. We rely on @11Tegen11 to look at the pass map from this game, which gives us an insight into the Palace’s shape and passing lines. 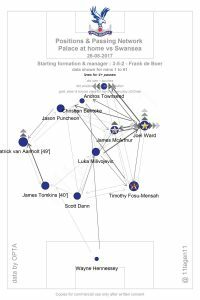 While Paul Clement’s side adopted a 3-5-2 formation, De Boer stayed faithful to his own style lining up the Eagles through a 3-4-3 shape featuring Jason Puncheon, Christian Benteke, and Andros Townsend up top. A key difference between Palace and Swansea’s attitude was the utilization of the midfielders as De Boer pushed one of his midfielders to go forward to support the forwards, while the Swans enjoyed a flat line of 5 in midfield, with a gap between them and the players up top. 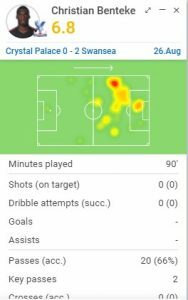 But the Eagles also had problems to link the team with Benteke as the Belgian forward just touched about twenty balls and netted 0 shots on goals. The image below shows the average positions for the players of both teams. Over there, you can see how the home side outnumbered Palace in the middle of the field. But Palace also showed some of the weakness De Boer wasn’t able to fix when at Inter Milan, the same that highly contributed to his dismission from the Serie A club. I mean of the problems his sides usually show to dealing with defensive transition. In fact, with the Dutch manager asking his players to be more courageous and push forwards with a large amount of players, his teams are usually exposed to the opponents’ counter-attacks, as showed by the following GIF. So, after three-straight defeats and with Palace sitting 19th place in the table, rumors have been raised that Parish and new Sporting Director Dougie Freedman are considering sacking De Boer and trying to convince Sam Allardyce to come back. That would be a lack of faith in a revolution that requires some time, especially with the players De Boer inherit. That said, the Eagles hit the ball long in the second half as many as any Palace side from the past seasons. Also, Crystal Palace footballers seem to have privately expressed their reservations about De Boer’s playing style: the same thing happened at Inter Milan. It would a be cheap shot to De Boer as has been in charge for only 62 days, a shorter stint than the 85-day spell he got at Inter where he coached just 14 games. Should his reign in south London come to an end, it would represent another blow for De Boer, who seems unable to raise up his coaching career after the four Eredivisie titles he won in six years at Ajax.